Yoshiki Sasai of the RIKEN Center for Developmental Biology (CBD) in Kobe, Japan has managed to grow eye precursors in the laboratory from embryonic stem cells. Such an achievement provides a remarkable opportunity to investigate early eye development and the pathology of eye abnormalities. Eye development is a complex process, since mammalian eyes develop as an extension of the central nervous system. The development of the central nervous system begins at about 18 days after fertilization with the formation of a thickened layer of cells on the surface of the embryo called the neural plate. The neural plate is induced by a cluster of cells that clumps together to form a hollow tube called the “notochordal plate.” The neural plate rolls into a tube called the neural tube and this neural tube is the beginnings of the central nervous system. The front of the neural tube will inflate to form the brain and the portion of the tube behind the brain forms the spinal cord. The neural tube forms as a result of high points that form in the neural plate called the neural folds. 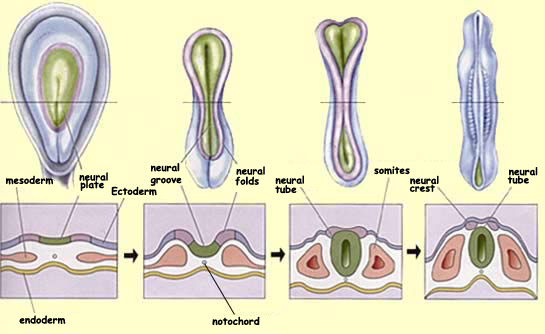 These neural folds fuse to form a tube that is below the outermost layer of the embryo (ectoderm). 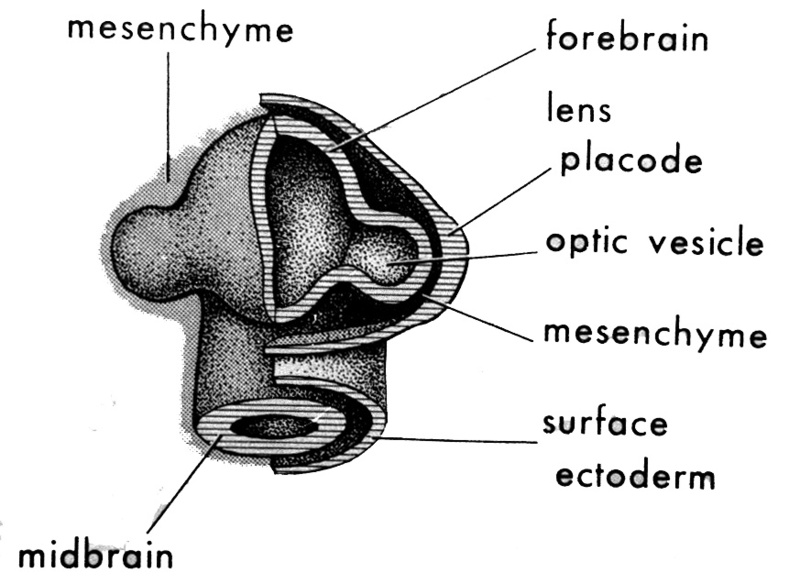 About 22 days after fertilization, inflations on either side of the developing brain extend from the brain, and these are the beginnings of the eye. These “optic vesicles” as they are called continue to grow until their connection to the brain becomes narrower and narrower. The narrow connections between the optic vesicles and the brain are called the optic stalks and they will become the rudiments of the optic nerves. Previously, stem-cell biologists were able to grow embryonic stem-cells into two-dimensional sheets, but over the past four years, Sasai and his colleagues have used mouse embryonic stem cells to grow well-organized, three-dimensional cerebral-cortex tissue (Eiraku, M., et al. Cell Stem Cell 3, 519–532, 2008)., pituitary-gland (Suga, H., et al. Nature 480, 57–62, 2011)., and optic-cup tissue (Eiraku, M., et al. Nature 472, 51–56, 2011). His present successes represent the first time that anyone has managed a similar feat using human cells. 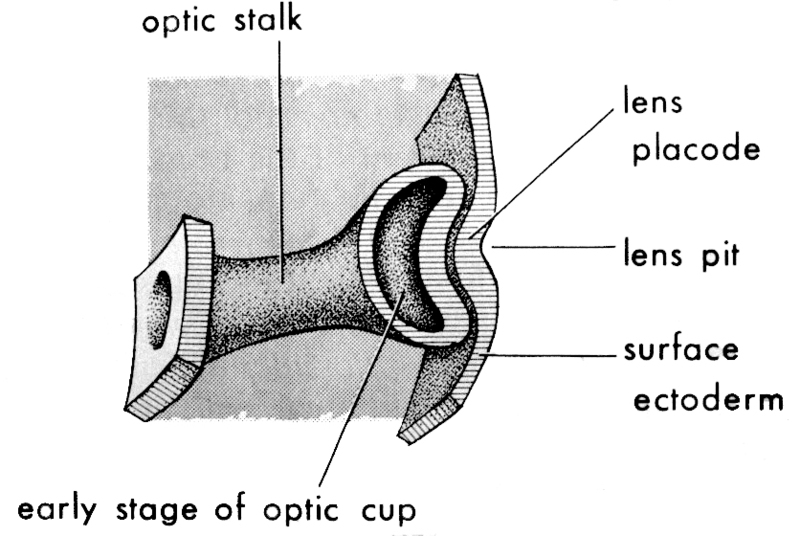 The fact that Sasai’s laboratory was able to grow the optic cup in the laboratory, and that it recapitulated the same developmental events in the same order shows that the cues for this the formation of the eye rely, primarily, on cue from inside the cell, rather than relying on external triggers. “This resolves a long debate,” says Sasai, over whether the development of the optic cup is driven by internal or external cues. This achievement could make a big difference in the clinic. There have been increasing successes cell transplantations in the last few years. For example, a last month, a group at University College London showed that a transplantation of stem-cell derived photoreceptors could rescue vision in mice (Pearson, R. A., et al. Nature 485, 99–103, 2012). The transplant involved only rod-shaped receptors, not cone-shaped ones, which would leave the recipient seeing fuzzy images. Sasai’s organically-layered structure provides hope that integrated photoreceptor tissue might be transplantable someday. The developmental process could also be adapted to treat a particular disease, and stocks of tissue could be created for transplant and frozen. Masayo Takahashi, an ophthalmologist at the CBD, has already started transferring sheets of the retina from such optic cups into mice, and she would like to do the same with monkeys sometime this year. The big question is whether transplanted tissue will integrate into native tissue. The big question is whether or not clinicians and stem-cell biologists can easily repeat Sasai’s results? Some, in fact, have already tried and failed to reproduce Sasai’s mouse experiment using human cells. “We need to know how robust, how reproducible it is,” says Smith.